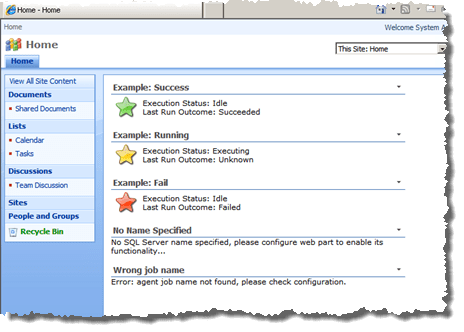 The Agent Job Status project provides a SharePoint Web Part that connects to a Microsoft SQL Server Agent Job and shows the status of a specific Job. The project provides a .wsp file that can be deployed to a SharePoint Farm. The solution contains a feature that contains a web part that can be deployed to a web part enabled page. The web part connects to a job of your choice and displays the current status of that job. This is useful for BI portal type pages where information about the current status of BI updates and processes are of benefit.